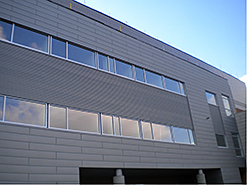 The Legacy and Element designs in the Architectural Series of metal wall panels enable rain-screen applications. Legacy provides a shingle-style look; Element features a reveal-style appearance. Available in aluminum, steel, zinc, copper, or stainless steel. Uses concealed fasteners and can be installed over structural sheathing or hat channels.